JHAPA, March 21: Government’s continuous efforts to eradicate elephantiasis have not been able to achieve desired results. Health workers share that educated people are the most reluctant to vaccination. “Negative messages about the medicine have made some people fear from taking it. 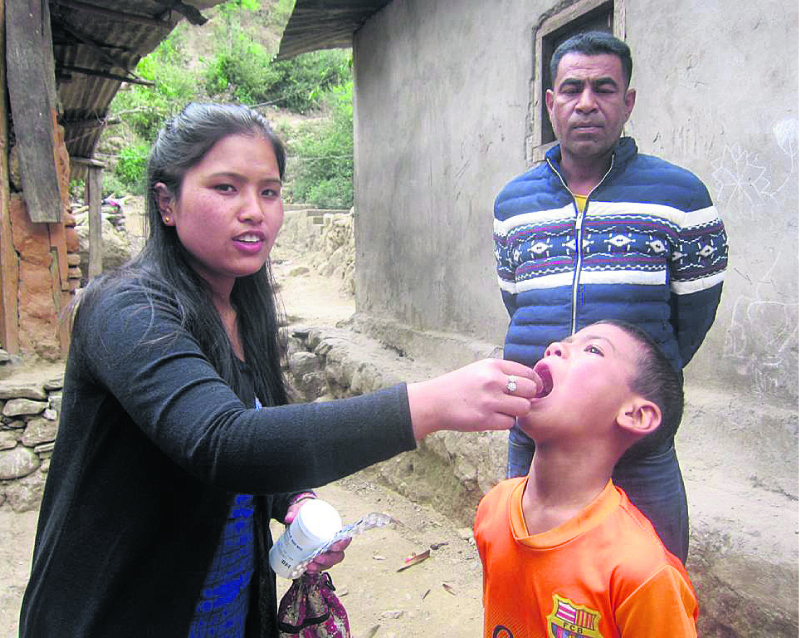 Educated people refuse to take medicine more than others,” stated Kamala Shiwakoti, a health worker from Laljhodi, Mechinagar - 15. “Some of them have very negative attitude towards the drug and it is hard to deal with them,” she added. Health workers like Kamala are all set for door-to-door visit to administer the elephantiasis drug coming week. The drive is scheduled continue until and unless all the community members are administered with the medicine. “We can take illiterate people into confidence. They take medicines when we tell them that it is necessary for eradicating the deadly disease. But, the same does not happen with learned people. They feel that they know more than us and do not listen to our arguments,” she said. She added that some political party leaders, teachers and other professionals are also skeptic of the drive. “They want to avoid it at any cost. They think that it is seriously harmful,” Kamala said. According to health workers around 70 percent people in Jhapa generally take medicine of elephantiasis during the annual campaign against the disease. Those who do not are basically the educated ones. “Every year they come to my house for administrating the drug. But I have heard that the medicine have severe side effects. So, I am not going to have it even this time,” Chuda Mani Luitel, a school teacher said. Luitel further stated that ‘he is a healthy man’ so far. And he is not sure whether the medicines will leave him that fit if consumed. “Why do I need to have it? I am in perfect health. I have heard that it is harmful and I don’t want to compromise my health,” he argued. The government aims to eradicate the disease by 2020. In the remaining three years, it is very challenging to meet the target if the general public does not supports it, health workers say. “It was almost eradicated earlier. However, it surfaced in some districts later. It is very important to eradicate it from the root and it can’t be unless it is administered to everyone. For this, everyone should take the medicine properly,” said Jiwan Chaulagain, focal person of the campaign in Jhapa. “The disease transfers to other human through mosquitoes infected with the disease,” he added. Since infected mosquitoes transfer it, those who refuse to take the medicines are serious threat to the eradication of the disease, health workers assert. Teacher Luitel argues that adverse effects of the medicine on health were widely published in media in the past. And with such reports, it is natural for people to fear from taking them, he said. “There have been cases in the past when people’s health deteriorated and some even collapsed after taking the medicine. When you know that, it is very natural to fear taking it,” he stated. Chaulagain meanwhile defended the accusations stating that the negative effects about the medicines were actually false rumors. “They were false. Over rated,” he claimed. “Some people died due to other reasons, but they related it to the medicine. Even natural deaths were blamed on the medicine,” he asserted. Cases of some people falling ill after taking the medicines have been widely reported in the last few years. Even though the government defends it, general public has not been convinced. Public Health Office reports that 73 percent of people took the medicine last fiscal year. Before that 70 percent had taken it. “26 to 30 percent people are not taking the medicine. Because of it the disease still exists in our society,” said Chaulagain. Health worker Hari Sharma shared similar experiences. Door-to-door visit for administrating the drug becomes very challenging as some people even react violently, he said. “When we try to argue about the need to take the drug situation goes violent. There is nothing we can do?” he lamented. Chaulagain reports that over 450 people are infected with elephantiasis in Jhapa district alone. In India bordering villages, the infection is even more rampant. “In the southern border with India, the problem is even severe,” he said. He said 733,000 people would be administered the medicine in Jhapa this year, for which, 700 volunteers and 400 health workers have been deployed. The disease is still visible in 70 countries in the world. And in Nepal, 61 districts are in risk of it, Chaulagain said.